"As every cell in Chile will tell, the cries of the tortured men. Remember Allende in the days before, before the army came. 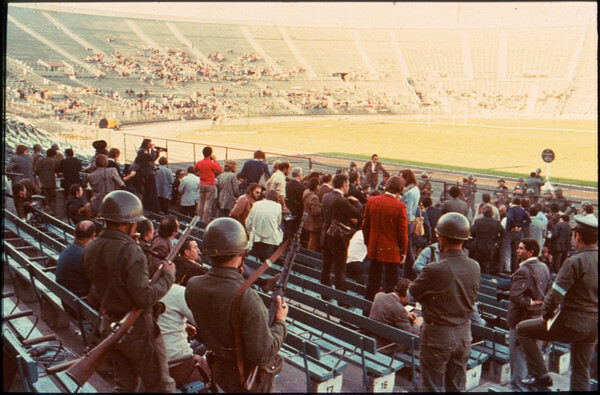 Please remember Víctor Jara, in the Santiago Stadium. Es Verdad, those Washington Bullets again." "And in the world a heart of darkness, a fire zone. Where poets speak their heart, then bleed for it. Jara sang, his song a weapon, in the hands of love. Though his blood still cries from the ground." 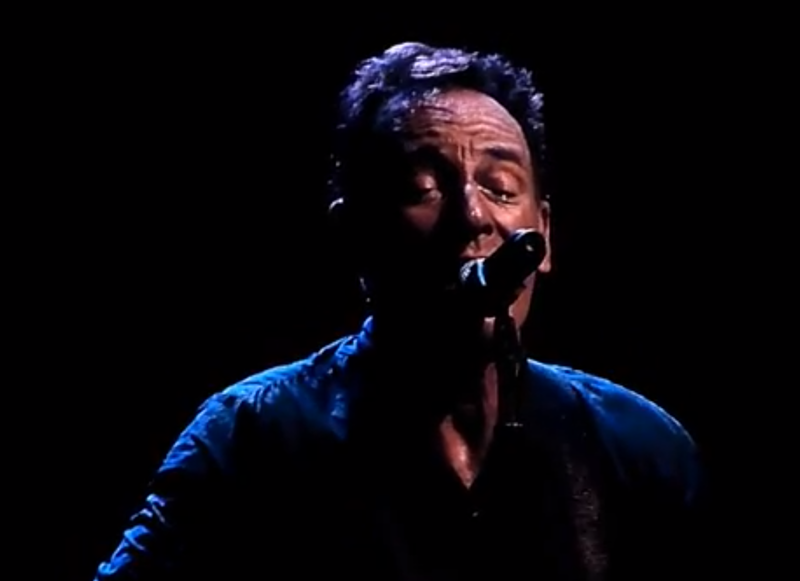 In Santiago, on the 40th anniversary of the CIA backed coup in Chile, Bruce Springsteen gave homage to Chilean poet and activist Víctor Jara by performing Jara's poignant song Manifiesto. 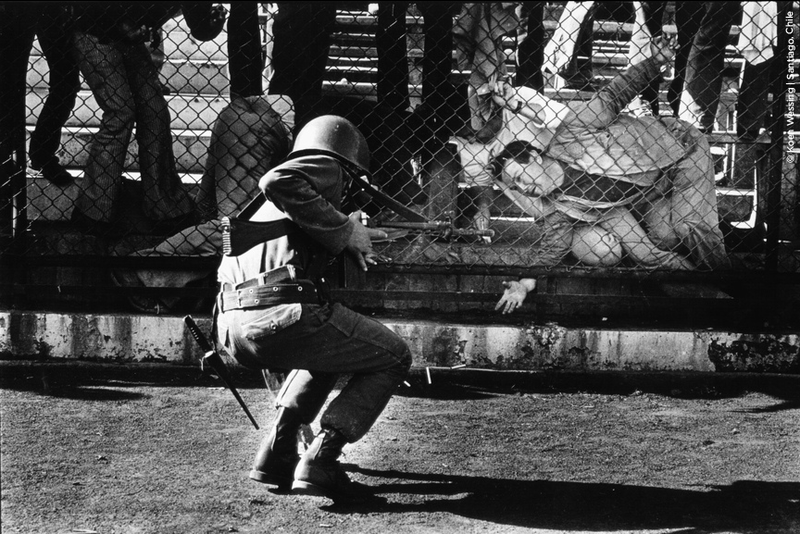 The 1973 Chilean coup ushered the brutal dictator Augusto Pinochet into power and marked the beginning of a bloody era in Chile. 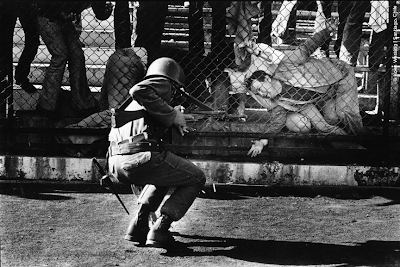 Thousands of people were arrested, tortured and killed by the military. "Victor called me to say that he couldn't get home because of the curfew, that he loved me and urged me to stay home and take care of the girls," she said. "What he didn't tell me was that he couldn't leave because the university was surrounded by tanks and under siege." From a smuggled message, Joan Jara was informed that Víctor was among 800 students and faculty members taken from Santiago's Technical University on September 12, 1973 to Estadio Chile (Chile Stadium) where thousands were being held by the Pinochet government. Many of those detained were tortured and killed by Pinochet's shock troops. Víctor's captors brutally beat him, smashing his hands with rifle butts and then, according to fellow prisoners, the guards mockingly suggested that Víctor play guitar for them with his battered hands. Defiantly, Víctor sang part of Venceremos (We Will Win), a song supporting deposed President Allende's Popular Unity coalition. "After that, Lieutenant Barrientos decided to play Russian roulette, so he took out his gun, approached Víctor Jara, who was standing with his hands handcuffed behind his back, spun the cylinder, put it against the back of his neck and fired." Then Lieutenant Barrientos ordered his troops to follow up with a machine gun coup-de-grace. Víctor's bullet riddled body was dumped on a street outside Santiago. A few months later in New York, Bob Dylan, Pete Seeger and Phil Ochs headlined a benefit in honor of Jara's life and work. 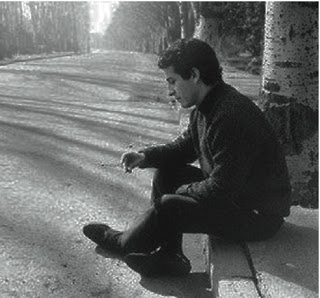 Joan Jara managed to escape from Chile to London with their two daughters and a number of Víctor's literary and musical works, including a poem Víctor wrote while imprisoned in Estadio Chile. Víctor's last untitled, unfinished work is a cry for hope amid brutality and injustice. Joan spent the next 10 years travelling the world bearing witness to the brutal coup in Chile, eventually moving back to Santiago in 1983. Joan established the Víctor Jara Foundation to keep her husband's memory and artistic legacy alive and she continues to fight relentlessly to gain justice for him in death. "En 1988 tocamos para Amnistía Internacional en Mendoza, Argentina, pero Chile estaba en nuestros corazones. Conocimos a muchas familias de desaparecidos, con fotografías de sus seres queridos. Fue un momento que se queda conmigo para siempre. Si ya es un músico político, Victor Jara continúa siendo una gran inspiración. Es un regalo estar aquí y lo tomo con humildad." Springsteen and the E Street Band followed up Manifiesto with We Are Alive, off of his latest album Wrecking Ball. The final track on Wrecking Ball, We Are Alive, is a folk hymn that weaves together death, sacrifice, memory, and transcendence. The song opens with the sound of a record needle scratching across vinyl - a nostalgic warmth that conjures up the history of recorded music. The sounds of We Are Alive bring us from Edison's wax cylinders, to vinyl LP's, to digital tracks. The words of We Are Alive lead us through the history of the struggle for human rights in the United States. Like a folk spirit cut loose from Dicken's A Christmas Carol, the singer of We Are Alive touches down in three stages of our country's life: the historical past of the 19th century, the recent past of 1960's Civil Rights era, and the contemporary reality of new immigrants trying to reach this land of promise. On September 12, 2013 in Santiago, Chile - We Are Alive also connected to global injustice and Nixon era America's brutal sins abroad. Víctor Jara's life and music continue to inspire resistance and revolution. Jara's Nueva Canción (New Song) continues to be sung in Latinoamérica and across the globe. Translated by Joan Jara. Read by Adrian Mitchell. From the album Manifiesto. Koen Wessing / The indelible Image / GAM / Santiago de Chile from Jeroen de Vries on Vimeo.